Diversification helps in reducing the risk involved in various investments. Hence instead of spending only in debt or equity, we diversify our portfolio in different asset classes. This video will give a basic understanding of Alternate instruments like real estate, gold, international investments, art and collectibles. It will also help in understanding the investment class which suites you best and should be part of your portfolio. This video is suitable for everyone who is looking forward to diversify their portfolio. Moreover general understanding of various asset class is important for everyone. With over 12 years of experience in financial markets, Mr. AlokDaiyahas been associated with top institutions like MotilalOswal and Kotak Life Insurance. 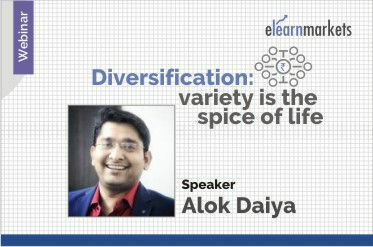 Currently he is a visiting faculty at Kotak Life Insurance, Deutsche Wealth Management, Kredent Academy & St. Xavier’s College (Kolkata).His area of expertise lies in the domains of Fundamental Analysis, Insurance (IC 33 IRDA), Technical Analysis, Mutual Funds, Investment Adviser Module (NISM), Derivatives, Sales Skill &Relationship Management.